Oystermouth castle was built by William de Longres shortly after 1106 when the Normans invaded Gower. The castle has seen more than its fair share of troubles in its life, with it being attacked and destroyed less than 10 years after it was finished in 1116 by the Welsh of Deheubarth who forced William to flee his home. Soon afterwards the castle was rebuilt when the Welsh were driven out but a few years later in 1137 the princes of Deheubarth took the castle again and once more destroyed it. They could not hold on to the area though and the land was taken by the Londres family who held it until they were driven out by Welsh forces led by Llywelyn the Great in 1215, who after taking the castle killed all the member of the Londres family. Only five years later the Welsh were driven out by Henry III of England who returned the barony of Gower to John de Braose who rebuilt the castle along with Swansea castle. A survey of Gower made in 1650 recorded the castle of being in state of decay, which was probably from the significance of the castle greatly declining as member's of the family who owned it lived elsewhere and the castle fell into ruins and remained unoccupied since around this time. 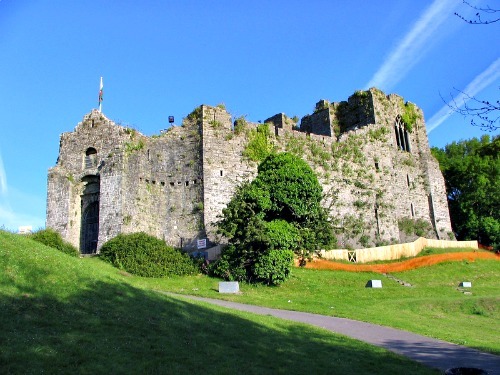 Today the castle is open as a tourist attraction and is maintained by Swansea council. There are many castle which are inhabited by some kind of "lady" and Oystermouth is no different. The most well known ghost here is refereed to as the white lady who has been seen and heard on many occasions. Who she is or why she lingers here is unknown, but the most common explanation is that she was a member of the Londres family who were all killed when the castle was taken by the Welsh. She has been described as being formed of a white mist like appearance and has been seen at the castle for many years, with local legend talking about her for several generations. She has been seen walking around all areas of the castle but only for a few seconds at a time until she disappears. The sound of crying has been heard on regular basis from rooms of the castle but upon investigation no one can be found. There is even the story of a man who was walking his dog in the area when he heard the sound of a horse and cart charging down the lane at some speed, though he could not see it. He even claimed to have jumped out of the way in fear of being hit by the unseen cart. The castle has also been investigated by various ghost hunting teams who have found some interesting results, including that of EVP and strange twisting mist like formation which only appear on photos.